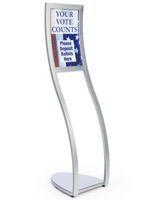 These poster holders, advertising sign stands are sure to draw attention to any display. The non-glare lens allows for clear viewing, while the sleek black metal adds to a professional finish. 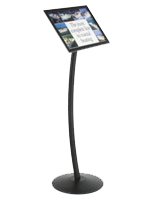 A signage holder, like these advertising sign stands, are commonly effective in settings such as restaurants, retail department stores, banks, museums, amusement parks and trade shows. The frame allows users to attractively advertise any current promotion, sale, menu, or pertinent information for customers. These advertising sign stands feature a round base and single pole design that allows these units to be placed in high traffic areas without being in the way. The base is weighted in an effort to minimize tipping due to bumping or accidental contact. 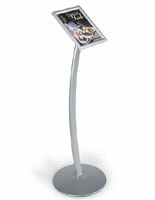 These displays are the ideal advertising sign stands when attracting consumer's attention. The curved post offers a unique profile that is certain to make passersby stop and take notice. These advertising sign stands, such as poster stands, or signage holders, are easy to use and make quick graphic changes a few snaps away. Once the sides, top, and bottom panels are snapped open, place a poster under the non-glare lens and "snap" shut all four sides. 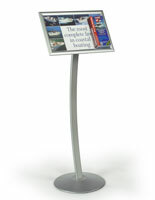 Standing on an elegant curved pole and sturdy circular base, these advertising sign stands are a stylish choice. 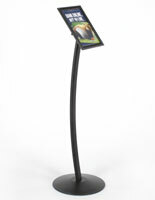 These poster holders ship unassembled, yet take just a few minutes to set up. 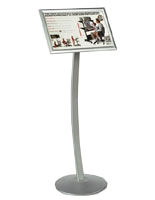 Each of these advertising sign stands come with an instruction sheet and hardware for assembly. We supply these units with the tools necessary for assembly. 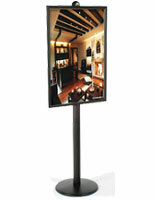 The advertising sign stands are an affordable poster display solution! 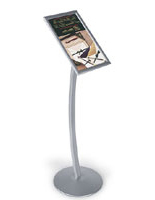 17.4" x 49.3" x 20.0"
The menu stand is perfect for our use! Love it! I'm very pleased with the heavy weight of the base. I'm not worried about it tipping over. The angle of the top is easy to read. We're glad the product fits the needs of your museum. Thank you for shopping with us!